LIBERTYVILLE, Ill. – Oct. 11, 2011 – Make fun times high-powered with Motorola ATRIX 2, the latest smartphone from Motorola Mobility, Inc. (NYSE: MMI). Thanks to its 1GHz dual-core processor, you'll have up to two times faster processing power than single-core smartphones. You’ll instantly feel the rush: faster web browsing, faster data download speeds of up to 21 Mbps, seamless multi-tasking and smooth-as-silk game play, so there's never a hitch in the action. All this on a stunning 4.3-inch qHD screen, razor-sharp and crystal clear. A dazzler by design, Motorola ATRIX 2 is a good-looking, high performer that gives you access to the best entertainment anywhere. Built for a fast-paced world, it's a smartphone that takes entertainment to the next level, with a price within reach. Eager to get your hands on it? Motorola ATRIX 2 will be available in the United States starting in mid- October, with subsequent launches planned for China, Asia, Middle East and Latin America. Remotely access content from your computer while on the go. With our free ZumoCast™1 app, you get secure, unlimited access to music playlists, pictures and videos straight from your computer’s hard drive — in real-time, without using your phone's memory. And with Music, our fully connected music player, Motorola ATRIX 2 gives you the power to play whatever you're craving. Plus, the Music app lets you access your favorite artists, song lyrics, and allows you to share what you’re listening to with your friends. With super-quick downloads, Adobe® Flash® Player 10 and a high-resolution screen, watching video and browsing the Web on Motorola ATRIX 2 makes fun larger than life. Whether it's a hot new remix, TV clip you can't miss, or that bonus level you're going to beat any day now (promise), you'll experience entertainment at its best. Step aside, standalone digital camera. With advanced imaging features, you can take pictures in an instant with shutter response that is faster than a digital camera. With an amazing 8-megapixel camera, you can take pictures clear enough for a poster-sized 16 by 20 inch print. Starting where the original Motorola ATRIX left off, this camera has better resolution so you can capture even more details. Motorola ATRIX 2 also has a full 1080p HD video capture for the highest video quality, smooth playback at 30 frames per second and speedy startup—you'll never miss a beat from start to finish. If a wireless hub is nearby, you can also video chat with PCs or other smartphones via GoogleTalk™. And to share pictures and videos with your friends and family, the Gallery app makes it easy to post on your social networks in no time. Or what you might call, proof of awesomeness. Want More Entertainment and Productivity? 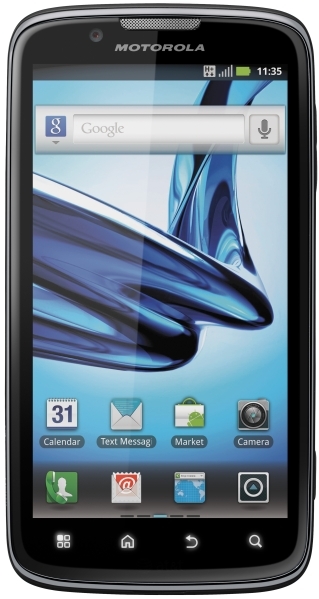 Experience the full potential of Motorola ATRIX 2 by using Motorola’s unique webtop application. Just plug into a Motorola LAPDOCK™ 100 and in seconds a large-screen display and full keyboard are at your fingertips – or plug into a Motorola HD Station, then use the HDMI out to connect to any size HD monitor or TV2. It's super-sized Web surfing with a full version of the Mozilla Firefox® browser, with its multiple-window capabilities to surf the Web, make a call, stream a video or run a business web application like Google Docs™ – all at the same time! All while charging your Motorola ATRIX 2 in the background. It’s the smartphone that’s always ready for more. Motorola ATRIX 2 is the right tool for any job, with everything a business owner wants and just what an employee needs. Motorola ATRIX 2 takes “work smart” to the next level with business-ready security and productivity features that would make any IT department proud. This is above and beyond what’s found in basic Android-powered devices, with PIN lock and password protection; inactivity timeouts; data encryption on both the device and the SD card; and the ability to wipe the phone remotely if it’s ever lost or stolen. It doesn’t disappoint when it comes to productivity either. Access to corporate address information, calendar resources and conference dialing is quick and easy. Email is easier too, with the ability to filter, spell check and view or download attachments in a snap.